We were 41 for 51 (80.4%) in cash lineups over the last 10 weeks, and we’re back for more cash in the Conference Championships! Let’s get to winning you some CASH in 2018 NFL Conference Championships! Also don’t forget to check out Ryan Whitfield’s and Joey Alibro’s DFS picks on this weeks Football Garbage Time Podcast! And if you want advice on specific players for Fantasy Football, check out Clipcast! Just type in the player name you’re interested in and you’ll get the exact clips from podcasts about that player! And you’ll get our clips as well! 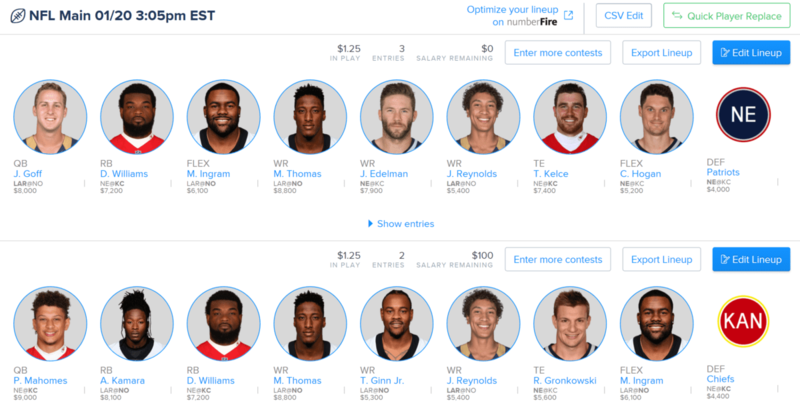 So, without further to do, here are my suggestions for the Best Daily Fantasy Football Plays for Cash Games for the Conference Championships, along with they’re prices on Fan Duel (“FD”), Draft Kings (“DK”) and Yahoo! Daily Fantasy (“Y!”). At QB, I don’t think you can go wrong with any of the 4 options, as they all have solid matchups in what promises to be an offensively focused weekend. But if I were going to pay up, I’d take Patrick Mahomes. Even though he’s the most expensive option, all the QBs on FanDuel are between the narrow range of $9000 to $8000, and on Draft Kings are between the narrow range of $6600 to $5400, so there’s really not much savings if you pay down. Mahomes has a great matchup against a New England secondary that ranked 22nd against the pass this season, which he clearly took advantage of the last time they met passing for 352 yards and 4 TDs in Foxboro. In addition, Travis Kelce is the only TE I feel safe about (he caught 7 of 10 targets for 108 yards last week and hasn’t had fewer than five catches since Week 1), even though he was shut down by the Patriots in their last meeting, and I like Tyreek Hill, who always has a high ceiling, and, if you need cap relief, Sammy Watkins, who managed to catch 6 of 8 targets for 62 yards in the Divisional round and finally looks healthy. Damien Williams had his breakout game in the Divisional round against the Colts, and has now scored in each of his past 5 games and gone over 100 total yards in 3 of those 5. I don’t expect he’ll match the whopping 30 touches he got in the Divisional round, but he should do fine with what he gets, even with Spencer Ware returning, against a Patriots defense that’s only 19th against the run per DVOA, and that allowed 4.9 yards per carry and almost 49 receiving yards per game to RBs this season. On the Patriots side, my favorite play is Julian Edelman (particularly on Draft Kings because its full PPR). Edelman caught 9 of 15 targets for 151 yards last week and has not received double digit targets in his last 9 playoff games (3 in 2014, 2 in 2015, 3 in 2016 and 1 in 2018), exceeding 100 yards in 5 of them, and he has no less than 6 receptions in every playoff game back to 2013. He now has the 2nd most total receptions of any WR in playoff history. 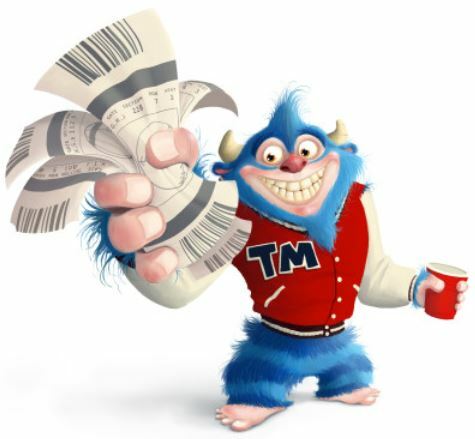 He’s a target monster and clearly has Tom Brady’s trust. I also like both Patriots RBs in Sony Michel and James White. Michel had 24 carries last week and 24 carries against the Chiefs in Week 6, and I wouldn’t be surprised to see him get a similar workload again with the ever-present multi-TD upside. White caught 15 of a ridiculous 17 targets last week just missed 100 receiving yards. The Chiefs defense allowed the 3rd most fantasy points to RBs during the regular season, is last against the run per DVOA and 21st defending RB receptions. I like White a little better in full PPR sites, but both are in play for me. I don’t really like any of the other Patriots options, as their hard to predict, but Phillip Dorsett has drawn 5 targets and had a TD in back-to-back games, so feel free to punt with him if you’d like. Chris Hogan let us down last week, but he still got 5 targets, and had a whopping 11 targets in the last game of the season, so he’s also worth a Flex punt. Rob Gronkowski was an all-world blocking TE last week, so I’m not thrilled with him in DFS, but he’s still the 2nd best option available and did have a big week last time he faced the Chiefs. If you want to pay down at QB, I don’t mind using Jared Goff. He’s the cheapest option on all sites and did manage to put up 391 yards and 3 TDs when he last met the Saints in Week 9. The Saints are 22nd against the pass per DVOA, and 3rd against the run, so its clear that the Rams will need to get their pass game going if they want to win. Plus, I wouldn’t be surprised if the Rams are chasing points for a good part of the game. With those facts in mind, I also like all 3 Rams WRs – Robert Woods, Brandin Cooks, Josh Reynolds (in that order) – more for half PPR sites like FanDuel than full PPR sites like Draft Kings because the targets are hard to predict, but all of them have potential to break big plays. Plus, the Saints defense is 3rd to last against WR1s and 2nd to last against WR2s. For the Saints, I’m focusing primarily on Michael Thomas and Alvin Kamara. Thomas caught 12 of 16 targets for a franchise playoff record 171 yards and a TD in the Divisional round, and leads the league in receptions (125). Plus, last time he met the Rams, Thomas had 12 receptions for a whopping 211 yards and TD. And to top it off, the Rams defense is 9th against the pass, but just 29th against WR1s per DVOA. Load up on Thomas. Kamara had 20 touches for 106 yards in Divisional round and managed to dominate the Rams with 116 total yards and 3 TDs in Week 9. The Rams are just 28th against the run per DVOA, so I like me some Kamara. If you’re hurting for cap space, I don’t mind punting with Mark Ingram, but keep expectations in check as Ingram has had a rough couple weeks in a row now. I’m also OK with a WR punt using Ted Ginn Jr., who although hasn’t put up the yards, did garner 15 total targets since returning from knee injury two games ago. Ben Watson us out this weekend recovering from appendicitis, so that leaves Josh Hill as the top TE in New Orleans. I prefer to pay up to Kelce, but if you’re looking to punt TE, Hill is your guy. As for Defense, use anyone that fits your lineup. I don’t see one standing out this week. But if I was forced to rank them, I’d got (1) Saints, (2) Chiefs, (3) Patriots and (4) Rams. 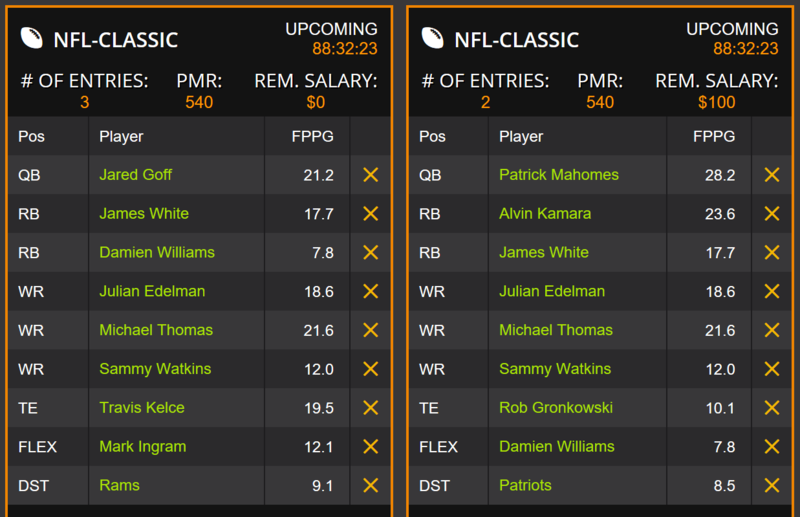 Good luck everyone, and I hope you all win DFS Cash in the Conference Championships!